Alex Toth fans are probably well aware of his work on DC's Johnny Thunder character in the 1950s. I am not that familiar with DC's western heroes, outside of Tomahawk and Super Chief. But here is a unique cover featuring both Gil Kane and Toth on the inks. 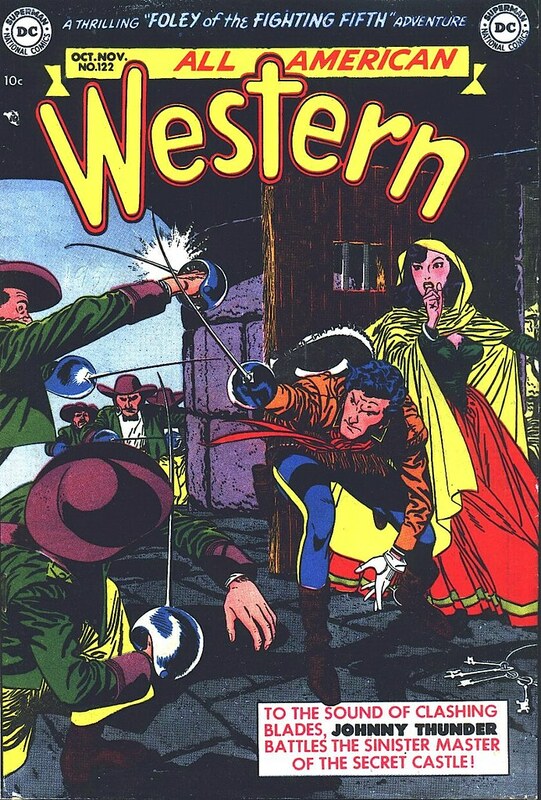 All Star Western #122, published in 1951. A real Zorro vibe to this cover. On the surface, it looks like Toth did the whole thing. You've got to want to buy this comic just based on the cover, a cowboy like Johnny Thunder using a fencing sword instead of a gun to rescue that girl behind him. 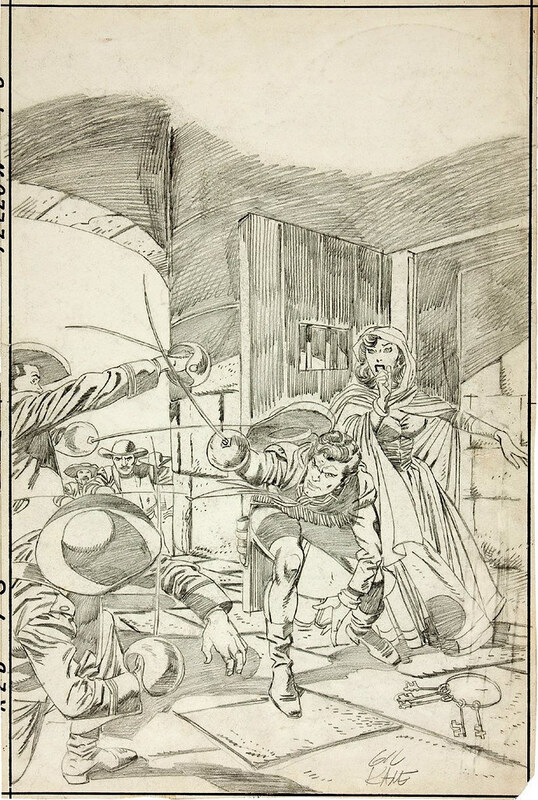 I recently found the cover pencils on Heritage Comics. Here you can see it was a fully pencilled Gil Kane cover. This is interesting in a number of ways. You can see early on in his career, Kane was really all about drawing action in a very fluid manner, a trademark of his style that lasted decades. Now I am wondering, was he influenced in this style by Toth? Also, note the way he added the shadows with very detailed pencils, something that I don't recall seeing in Kane's 70s covers. After Toth added the inks, the faces of the figures were transformed into his signature look. I wonder if these two worked on other western covers? I did a quick search to see what history these men had together, and from what I read on Comic Book Resources forum, it wasn't an easy relationship. Nuff Said! That's crazy, I would've assumed those were Toth pencils with Kane inks. Everything about the poses, composition, layout, and shadows screams Toth to me. I've heard it said that Toth set the house style for DC in the early 50's, so many Kane was a Toth disciple at the time and was able to do a faithful "homage" to his layout and drawing techniques.